The Obama administration shifted its stance on Iran’s contested nuclear program Wednesday, writing in a letter to the United Nations that it is concerned the international community’s nuclear watchdog organization is not fully reporting on potential Iranian violations of the nuclear deal. The administration also renewed concerns about Iran having violated its international commitments by stockpiling too much nuclear-related material. The renewed concerns come after Iran repeatedly test fired ballistic missiles in violation of current U.N. resolutions. Yukiya Amano, chief of the International Atomic Energy Agency, or IAEA, said earlier this week that the agency is prohibited by the nuclear agreement from publicly reporting on potential violations by Iran. The revelation prompted criticism from outside nuclear experts, including a former IAEA deputy director general. The limited reporting could prevent the international community from detecting potential nuclear violations by Tehran, according to these observers. However, the Obama administration initially dismissed these concerns, with officials telling the Washington Free Beacon and other news outlets that "there isn’t less stringent monitoring or reporting on Iran’s nuclear program." One State Department official who spoke to the Free Beacon Tuesday said it is "a distortion to say that if there is less detail" in the reports, then there is "less stringent monitoring or less insight into Iran’s nuclear program." By Wednesday morning, this rhetoric had shifted. The administration now says that the reports on Iran should be more "robust and detailed," according to a letter submitted by U.S. Ambassador Henry S. Ensher to the IAEA’s board of governors. "It is vital that the [IAEA] director general continues to provide robust and detailed reporting on Iran's implementation of its commitments," Ensher wrote, according to a copy of the letter. "Sufficiently comprehensive information in reports avoids misunderstandings." The level of reporting "is essential to ensuring that Iran’s nuclear program is and will remain exclusively peaceful," Ensher wrote. 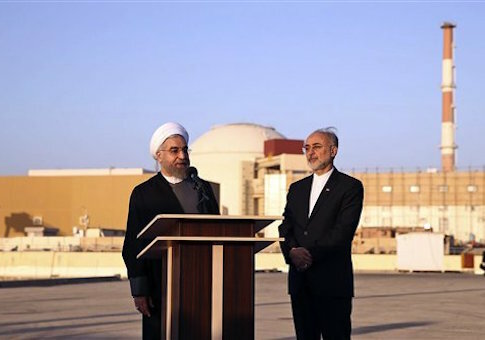 "Full implementation will assure the international community that Iran's potential pathways to obtaining a nuclear weapon have been firmly closed off." Ensher said the nuclear agreement still permits the IAEA to fully investigate potential Iranian infractions, though it remains unclear how much of this information will be made public going forward. "It is important to note that the IAEA retains its full authorities to investigate any new concerns that may arise in Iran, including any new concern regarding weaponization-related activities," he wrote. Ensher also disclosed U.S. concerns that Iran is currently violating the deal by stockpiling too much heavy water, which is used in a nuclear reactor. "We note with serious concern Iran's temporary accumulation of heavy water in excess of its agreed stockpile limit, and welcome the quick actions taken to remedy this inconsistency with Iran's commitments," Ensher wrote. Foreign policy insiders say that the Obama administration’s shift on the issue is emblematic of its dealings with Iran. "This reversal is the latest in a seemingly unending stream of Iranian illegality and sanctions violations that the administration initially tried to ignore, then tries to justify, and then, finally, promises to deal with," said one senior foreign policy consultant who has worked closely with Congress on the Iran issue. Meanwhile, Iran for a second day in a row test-fired ballistic missiles, which is a violation of U.N. Security Council resolutions. The Obama administration implemented new sanctions on Iran in January for similar behavior. Wednesday’s launch included missiles that were marked with rhetoric advocating the destruction of Israel and the United States. Sen. Mark Kirk (R., Ill.) called the second missile test "a direct threat to Israel on the same day Vice President Joe Biden is actually visiting Jerusalem." "Since the enactment of the flawed nuclear deal, the U.S. has under-enforced current sanctions on Iran’s ballistic missile program," Kirk said. "Today is another example of this administration’s policy of they are ‘not supposed to be doing that.’ Instead, we should send the president bills to stop Iran’s Islamic Revolutionary Guard Corps, as well as the Ministry of Defense, Aerospace Industries Organization and other related entities driving the Iranian ballistic missile program." Update: 4:50 p.m.: Asked on Wednesday afternoon about its evolving stance on the IAEA, State Department Spokesman John Kirby explained that the administration had to do some "homework" before arriving at its current determination. "I didn't know" about Amano's comments earlier this week, Kirby said. "So in the intervening 24 hours, we did do some homework and learned a little bit more, and that's why I was able to talk to you yesterday about it with a little bit more granularity." Pressed by reporters to comment further on the IAEA's revelation that it is limited in what it can report publicly about Iran, Kirby said the administration maintains confidence in the agency's ability to provide oversight on Iran. "We want these reports to be as thorough as they need to be," he said. "And as detailed as they need to be, so that the agency can have the level of confidence it needs and so that the board of governors can have the confidence that it needs." Kirby went on to dismiss concerns that the latest IAEA report does not contain enough detail about Iran's compliance with the deal. "What matters–it's not whether it's more detail than under JPOA or less detail," he said. "It just has to be enough detail so that a proper verification can be made, a proper compliance report can be arrived at."